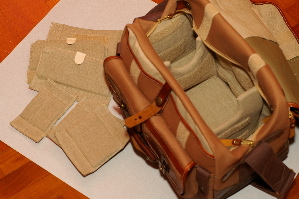 Fogg Diva with the hand luggage strapes kept at the sides. 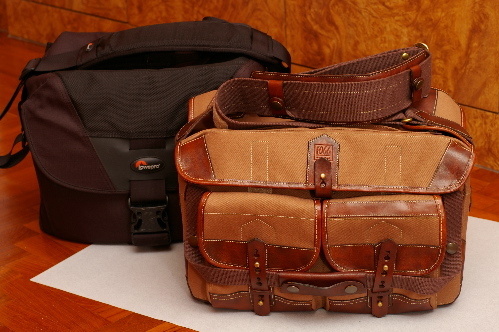 I have been a long time Lowepro user and find Lowepro bags good value for money. They are good for practical and heavy use but nothing really exciting about them. 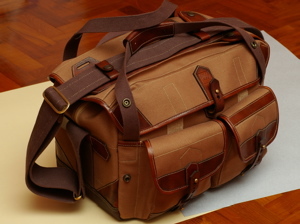 Then there are these Billingham bags readily available in Singapore. 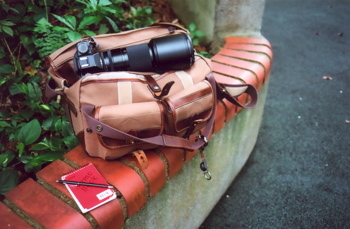 I believe these are the bags Leica users go for but I am not quite attracted to their designs, and they are expensive. 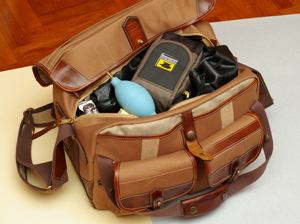 I am not aware of Fogg camera bags until one day in a popular Singapore photography forum clubsnap.com discussion thread someone mentioned about it. 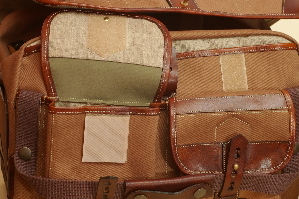 When I took a look at Fogg website I straight away fell in love with their hold-all bags. 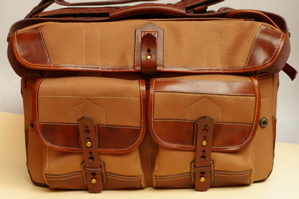 These Fogg Hold-alls somehow appeal to me. 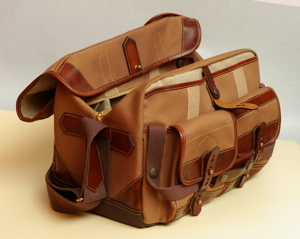 They are also making satchels but personally they look feminine to me, and so are Billingham bags, but taste can be very personal and people will have different views. 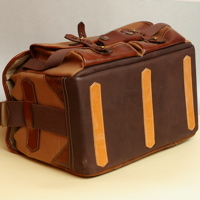 Front view of the Diva and the all leather base. Back of Diva, with rear zip pocket and rear grap strap. Next thing I do is of course to find out the price. And not really a surprise to me, such exclusive and unique looking hand-made bags are expensive. So the price did make me hesitate for quite a while, and at the same time still going to Fogg website to examine the various hold-all models. Meanwhile I realised one of my personal friend in photography equipment business bought a Fogg bag many years ago in London, and probably is the Cello hold-all. And that give me a lot of confident as this friend of mine has good (and expensive) taste. You know it is really difficult to figure out which is the correct bag as dimensions on the website cannot really help one figures out the physical size of the bag. And at that price I cannot justify to get different bag for different occasion. So after many thoughts I settle for the Diva model, for I think its size is appropriate for me, very close to the Lowepro Stealth Reporter D400AW that I am using, and also for its look. Diva side by side with a Stealth Reporter D400AW. As there is no Fogg local agent in Singapore at that point of time, I then approach Bee and Nigel directly. It is a wonderful experience dealing with this couple who are the owners of Fogg. Bee and Nigel, and that’s the way they address themselves in their friendly emails. Both of them are photographers. They started the business in UK and later moved to France. 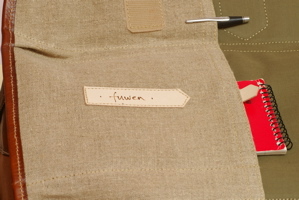 The bags they shipped today are still hand made by two of them, not common in today’s made in China mass production mainstream world economy. It took quite a while for my bag to arrive. I placed the order in 2007 Christmas period and received the bag in Feb 2008. They only started to make my bag after receiving my order. The long time probably is due to Christmas/New Year holiday seasons, the cold weather up there in France, and a small incident that they need to stop work for a while to deal with. Diva with the dividers, and with the hand luggage strapes on the top rain-flap. 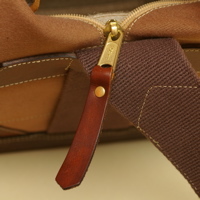 A broad shoulder-pad is supplied, attached to the shoulder strap by Velco and bottons. The design is very comfortable to use in practice. So it was an evening on 26 Feb 2008 that I opened the parcel, which is supposed to be my Christmas/New Year/Birthday present (whatever reasons I can think of). What a nice bag it is! I chose the mocha/oak colour combination. 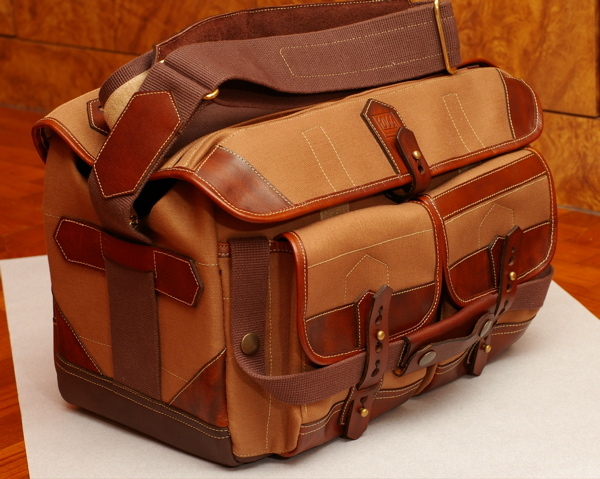 While the bag looks masculine on the website it feels feminine when I touch it. 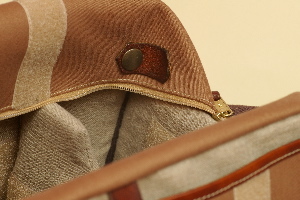 The bag is made of rubberised cloth and leather trimming, so I was expecting a rather hard bag but turns out the bag has a soft, comfortable feel. 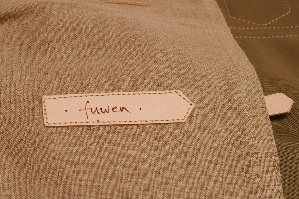 Nice stitches and fine workmanship. As I am not really a careful user so a dark colour combination will not look so dirty in the long run. My initial is branded on the top flap of the bag. 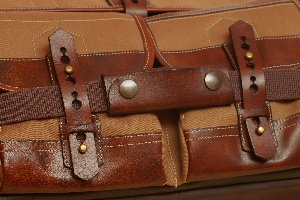 A large shoulder pad is supplied to be secured by Velcro and buttons on the strap. This shoulder pad design in practice is surprisingly comfortable. Several dividers are given but I will probably use only the 2 cradle dividers to separate equipment and provide additional stiffness. My initial was branded on the inside of the top rain-flap. 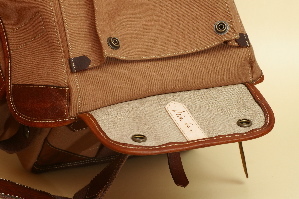 The rain-flap comes with pouch on the outside and pleated pockets inside. The volume is good enough for my range finder with 4 ZM lenses (15, 21, 28 and 35), my small SLR with 3 lenses and 2 tele-convertors (50/1.4, 100 macro, 180, Mutar II and III), a Metz flash, accesories for range finder (external view finders, spirit level etc), cable releases, blower, lens cleaning cloth, Gossen light meter etc etc. All the lenses are kept in their respective pouches. The Diva with full equipment. 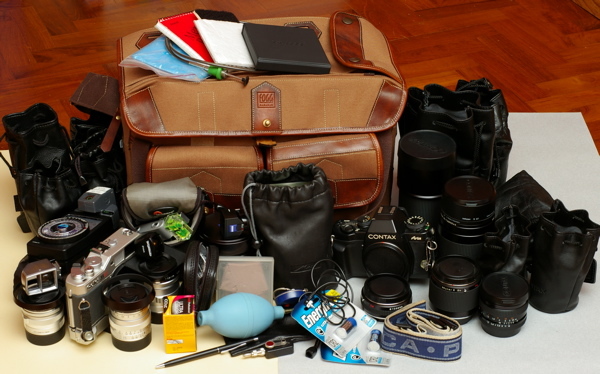 All lenses are kept in their respective pouches. 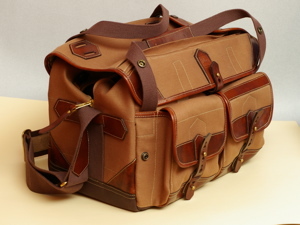 I would not say Fogg bags are everybody bags, as they are not priced to be so. 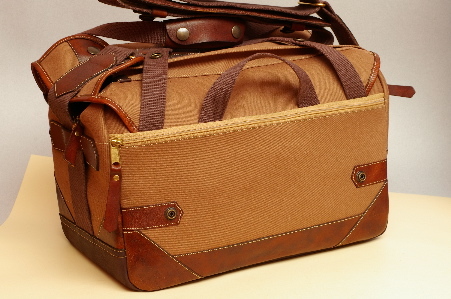 But for people who appreciate hand crafted master piece, or for Leica and Billingham users, Fogg bags could be a good choice or alternative. 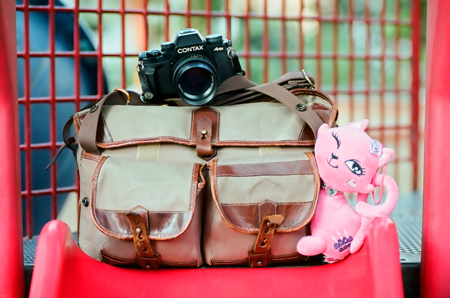 From what Bee and Nigel have told me, their best sellers are the hold-all Cello, the E-flat satchel and the B-laica satchel. For the Singapore potential users, the good news is that there is now a local representative for Fogg in Singapore, none other than Chii Fei, who is quite well known for being friendly and providing good services as a Voigtlander representative in Singapore. As for myself, I would say I am fortunate also to have been dealing directly with Bee and Nigel, a very personal and nice experience communicating with them over emails. You know, it is fun reading their emails, many a time witty and in many occasions amusing!